"The Zionists claimed Palestine and renamed it 'Israel'"
- France would receive areas marked (a), which included: the region of south-eastern Turkey, northern Iraq - including Mosel, most of Syria and Lebanon. - British-controlled areas were marked with the letter (b), which included: Jordan, southern Iraq, Haifa and Acre in Palestine and a coastal strip between the Mediterranean Sea and the River Jordan. - Russia would be granted Istanbul, Armenia and the strategic Turkish Straits. 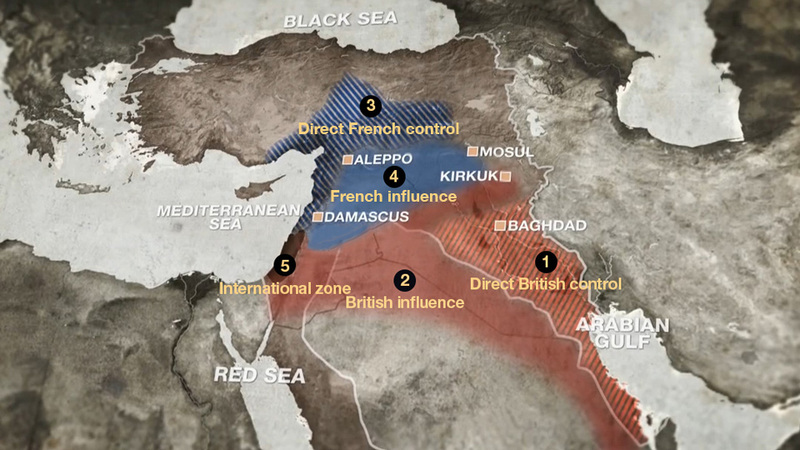 "... in the blue area France, and in the red area Great Britain, shall be allowed to establish such direct or indirect administration or control as they desire and as they may think fit to arrange with the Arab state or confederation of Arab states." "Neither the Balfour Declaration nor the Mandate ever specifically concede that Palestinians had political, as opposed to civil and religious, rights in Palestine.The idea of inequality between Jews and Arabs was, therefore, built into British - and, subsequently, Israeli and US - policy from the start." Ninety-nine years later, Palestinians insist that their rights in Palestine cannot be dismissed, neither by Balfour, nor by his modern peers in "Her Majesty's Government". Another way this article could be titled is ' How Ancient Greece wrought destruction on the World.' They created the Khazars who became the Ashkenazi; a monotheistic structure designed to fall yet serve the temporary purpose in extremism of claiming possession of soul in the World which no self respecting Greek would, knowing that that it would endanger their personal connection in the soul. Possession of the soul can be seen in their sacrificing or 'keeping a World', where Hera and Zeus lose their souls to Absolute law with the other Gods merely 'acting out their will'. The Rothschild family took over the British Crown (12 men +1 other and based on the Olympian calendar), with the assistance of the British royals under the cover of the Crimean war and Britain has been under Rothschild directorship ever since. History now shows clearly the intent to remove the Dutch from South Africa, the Kaiser from Germany, Romanovs from Russia etc. 'If they can be deceived, it must mean that they want to be deceived '; so, in using the test of Hegelian dialect in creating a problem that if there is a reaction, the will of the tested can be found to be reflective to the tester or dead in the World and so thereby justifying the sacrifice. The Greek intent to have a world of their own is little known; that the Trojan war was a false flag by which to infiltrate the Italian Celts, that Henan Cortez was set up like the Khazars; that Islam and Christianity were created to create emotional and mental extremists so thereby blind the soul of either adherent; that Greater Israel is Africa and how today's global politics are being choreographed in line with the return of the Suns binary twin (and consequential glaciation) which can be found in the book of revelations; subjugation of the soul by foreigners; by design. system Who can always take it back to an earlier group, but the basic dynamic remains in place... we live in 'Purgatory'... 'dark side' rules here... after the 'Fall'... no pain, no gain... does it matter the name given to the oppressors? Aren't they all Satanists? I do wonder why these self-proclaimed 'Chosen People' of Satan haven't just gone 'over'... why remain here as servants? Haven't they the burning desire to 'graduate'? why wait? Haven't they made the cut yet? Are they having problems with their tests? Having too much fun can create other difficulties, and being too servile seems to serve only in helping their leaders clog up the drain. Remaining in that position too long means being flushed down the drain when the plumber arrives. Can't blame the Greeks for that... nor any name but those making or that have made the Choice. IMO, staying seems weak... which makes you wonder about their fitness for being a true servant of 'Satan'.... but what do I know, right? Most Americans know November 11 as 'Veterans Day' -- the day we honor the poor chumps who have "died for our freedom" (barf), as well as the living ones who knew not and know not of dark powers that misuse the Department of Offense. We do not intend that in any way as an insult to our vets; but that is the tragic historical reality of the situation. Lord Balfour had no more right to give Palestine to Jews than the US has to give Ireland to Japan. But here we are 70 years later and the land has been invaded by north-northeastern European Jews with no historical connection to the land whatsoever.. Israel is a creation of the Rothschilds. Period. There was never a 'country' called Israel. There were always, and remain today, a TRIBE. Nothing more. However, no one dares go up against Israel, or its 'hitman' (the Rothschilds) will destroy their economies through their corrupt the destructive Central Banks world wide. Egypt was payed to be created by ancient Greeks after the interglacial melt 5717 yrs ago,using gold and electrum from Wales. This was achieved using information collected by Jason of a volcanic source. This source is known to me, and the electrum is in the region of 40 to 50 % Au. Druids were formed by the Greeks as a religious guard by which to give protection to the intervention while Phoenicians provided the shipping arrangements. The Roman written record from the four year pre invasion reconnaissance held in the museum of Rome, found Wales unique on the island of solar cultures in being divided north and South by what they described as a military government whom patronised Druids. I have found a Roman genocide site here from the where stone walls have been created exclusively from stone hammers and axes and is probably from where the lies of a mountain hunting culture being sheep herders, were spawned. Let the Rothschilds pay to relocate Israel. I do not question their right to exist, Let the Rothschilds compensate the Palestinians for a hundred years of murder and theft. Britain should hang it's head for the shame of it. Awordinyourear What makes you think the Rothschilds care about Israel? Do they live there? Maybe they do, but I never heard about it, nor most of our 'famous' Chosen People of Satan... isn't the goal to create a zone of chaos, not to live there? Why would they want to live in a land of psychos that don't like to follow orders? They find their fellow club members much better to deal with, much more accomodative to their interests... so why would they bother with the Isrealis? They are mostly pawns, the smart ones don't stay there... they might visit, but no more, right?